The other month Pakistan opposition politician Imran Khan warned that foreign aid from Britain never reaches deserving people and that Pakistani politicians were syphoning off cash from the multi-million pound aid budget handed over by the UK’s Department for International Development. Imran Khan’s remarks came after a report produced by the Taxpayers Alliance revealed that British aid spending had done nothing to help the economic or political freedoms of people in the countries which get the cash. In fact, the investigation stated that twice as many countries lost freedoms after receiving British aid than improved their people’s political and human rights conditions. Despite this, ‘giving alms’ to Africa, and other perceived poverty stricken parts of the world, remains an incredibly popular idea that politicians think will win them votes and for which millions of citizens will happily campaign for or proselytize about. This post seeks to explore the main damaging consequences of foreign aid and to explain how the phrase and concept itself is an Orwellian double speak. One of the most frequent criticisms of foreign aid is how it fuels rampant corruption in the countries that receive it. Money that the UK government markets to the gullible electorate as being destined to help the destitute in the third world actually ends up creating and supporting inorganic, bloated and unnecessary bureaucracies in the form of both the recipient country governments and the donor-funded NGOs. The net result of this is to make it all too easy for the funds to be used for anything, save for what their developmental purpose should be, or what products and services would otherwise be supplied in an open market. The economic environment that created aid bureaucracies has therefore built unproductive organisations that define their output as money disbursed rather than service delivered, produce many low-return observable outputs like glossy reports and “frameworks” that can be used to justify their spending and put enormous demands on those with scarce administrative skills in poor countries who could otherwise be engaged in doing something useful. This growing phalanx of corrupt, meddling, unaccountable and overpaid bureaucrats imposed on countries thus makes it very hard for local businesses and wealth creating activities to develop as the imposition of these parasitical alien administrations not only hoover up and corrupt the brightest and most dynamic of the host population but also spin a suffocating web of rules and regulations devoid from any local business context. The significant debt burdens of less developed countries have often been incurred as a result of the foreign aid packages pushed by wealthier countries and Western institutions and pursued by corrupt and greedy politicians and businessmen in recipient countries. ‘Foreign aid’ is quite a comprehensive and encompassing term. Most people don’t realise that loans are usually embedded in aid packages, either directly or as a condition of foreign aid donations being given in the first place. An overload of debt combined with punishing interest rates creates the condition of economic subservience to the creditor nations and institutions and ties down, in a perpetual manner, most of the Third World Countries to underdevelopment, dependency and poverty. 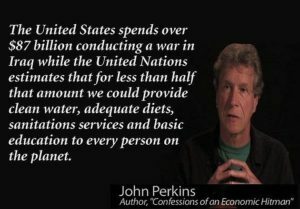 In his seminal autobiographical book ‘Confessions of an Economic Hitman’ John Perkins describes his job as the Chief Economist for the US international consulting firm Chas T. Main as to implement policies that promoted the interests of the U.S. corporatocracy (a coalition of government, banks, and corporations) while professing to alleviate poverty. He did this by convincing strategic countries to accept enormous loans for infrastructure development and to ensure that U.S. corporations got the projects (and the money) as a result. Upon default of the loans, the United States Government, World Bank, International Monetary Fund, and other U.S. dominated aid agencies then have access to the countries’ resources (especially oil) and strategic land (and are also able to instal military bases). Perkins says that international economists are in essence highly paid “Economic Hit Men” hired by international corporations to hide the U.S. government’s involvement. As aid flows in, citizens of the recipient countries effectively become dis-enfranchised as increasingly all their governments need to do to stay in power is to court and cater to foreign donors. Such governments have less of a need to raise taxes, and as long as they pay their army and security apparatus well, they can be relatively relaxed about the views and opinions of their disgruntled people. Its stated that across Africa, over 70% of government income comes from foreign aid, meaning that such administrations are seriously compromised and unlikely to act in accordance with the interests of their populations. Similarly, in donor countries, for all the billions of dollars of foreign aid money appropriated from their taxpayers over the years, no clear, effective system has ever been put in place to hold aid recipients and governments accountable for how the money is spent. Such spending serves to increase the power and unaccountability of governments and lessen the influence of otherwise free thinking and responsible individuals who would be able to trade and produce wealth through voluntary exchange. This anti-democratic system has reinforced social inequities and perpetuated cycles of political abuse that lead to an entrenched and pernicious from of authoritarianism that empowers the elite few, while keeping a majority of people in abject poverty. The West stands by duplicitously and watches as a succession of wily autocrats in recipient countries hone their skills to beat back any democratic challenge and carry out the bidding of their overseas masters. The dependence on foreign aid means that it becomes the opiate of the Third World. In a similar way to how the development of the welfare state in the UK and other developed countries has completely undermined and destroyed society by removing the need for communities to develop themselves through cooperation and exchange and by instead supporting and facilitating anti-social and irresponsible behaviour, foreign aid has largely encouraged Third World governments and their populations to rely on hand-outs instead of on themselves for development. “One of the examples I offer in this regard is from a village in western Mali. This small town had a market garden built for them by an international NGO, with several wells that had been constructed by another NGO. When a fellow volunteer started her service in this village, two of the three wells had collapsed and needed to be rebuilt. An example of this phenomenon is the US ‘Food for Peace’ program that was created in 1954 to help the Eisenhower administration get rid of embarrassingly large farm surpluses. In the 1950s and 1960s, massive U.S. wheat dumping in India disrupted that country’s agricultural market and helped bankrupt thousands of Indian farmers. George Dunlop, chief of staff of the Senate Agriculture Committee, speculated that such food aid may have been responsible for millions of Indians starving. 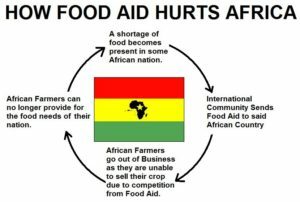 Although food aid programs may sometimes alleviate hunger in the short run, the overall effect of them appears to be the disruption of local agricultural markets, making it harder for poor countries to develop their own resources and feed themselves in the long run. Foreign aid creates poverty through economic institutions that systematically block the incentives and opportunities of poor people to make things better for themselves, their neighbours and their country. The Poverty Cure website highlights well the failure of foreign aid to stimulate trade and wealth creation. Instead it calls for the focus of foreign assistance to shift from aid to enterprise, from poverty alleviation to wealth creation, from paternalism to partnerships, from handouts to investments, from seeing the poor as consumers or burdens to seeing them as creators and from encouraging dependency to integrating the poor into networks of productivity and exchange. More than half of the international assistance spending related to Afghanistan, Iraq, and Pakistan is for military or security uses. For example, some of the international assistance funds sent to Pakistan have been used to train their Frontier Corp in counterinsurgency. Of the $18.4 billion appropriated for the ‘Iraq Relief and Reconstruction Fund’ in fiscal year 2004, more than $10 billion was administered by the Pentagon. In ‘War Games: the Story of Aid and War in Modern Times‘, Dutch author Linda Polman argues that humanitarianism has become a massive industry that, along with the global media, forms an unholy alliance with warmongers such that the most likely beneficiaries of war zone operations are the powerful and abusive, rather than the most needy. Soldiers and militias are sustained by levying taxes on aid, cargos and the movement of charity personnel, and by stealing or diverting funds. It is also these elite groups that have best learned the images and triggers that attract aid. Polman provocatively states that sowing horror to reap aid, and reaping aid to sow horror, is “the logic of the humanitarian era.” Two examples she gives are how Christian aid groups that set up “redemption” programs to buy the freedom of slaves in Sudan drove up the market incentives for slavers to take more captives, while in Ethiopia and Somalia during the nineteen-eighties and nineties, politically instigated, localized famines attracted the food aid that allowed governments to feed their own armies while they further destroyed and displaced targeted population groups. 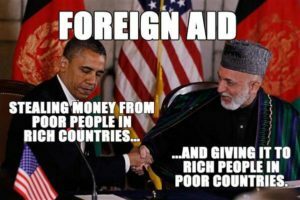 Foreign aid represents money, or wealth, that has been seized by force from taxpayers whether through taxation or increased government borrowing (with the taxpayer base used as collateral) to finance the aid. When the aid is spent it therefore doesn’t represent the careful and considered judgment of those who have legitimately earned money through voluntary exchange. As a result many aid programs are ill-conceived and economically unsound, tending to support gaudy and extravagant projects, reckless spending and grandiose loss-making state ‘enterprises’ that don’t benefit anyone in any meaningful way. Further, many of the less developed world’s state enterprises, set up with foreign loans, were supposed to earn or save these countries the foreign exchange needed to service or pay back the loan, but instead, these enterprises racked up losses upon losses, and used up more foreign exchange to compound the problem. Thus it is unsurprising that in Africa, Asia, and Latin America, the U.S. Agency for International Development (USAID) has dotted the countryside with “white elephants” such as idle cement plants, near-empty convention centers, and abandoned roads, amid institutional decay, deteriorating infrastructure and environmental degradation. This list details some pretty tragic examples of failed aid projects in Africa, including the $3.5 billion spent on a Lesotho Highlands water project that ruined the lives of tens of thousands of local people and resulted in the conviction of three of the world’s largest construction firms on corruption charges. On closer inspection, the very idea that the purpose of aid is to alleviate poverty seems incorrect. Instead, it is actually an important function of Western imperialism. In the majority of cases, the actual function of publicised aid from Western governments and their agencies, including the World Bank and the IMF, is to subsidise and facilitate the operations of the corporations and banks of the West. Aid was, and is, therefore used by governments and big aid agencies to ensure that the governments that receive the money adopt policies that favour not necessarily capitalism itself, but the interests of the foreign corporations and banks, in particular those that target less developed countries they have yet to adequately entrench themselves in. These institutions demand privatisation to sell off the public assets of the recipient countries cheaply to foreigners (often after a significant devaluation of the local currency resulting from debt defaults), the removal of controls on imports and on the export of capital. These aims mean that the aid agencies support only pro-Western and often repressive governments, some of them the product of US-supported military coups, while patriotic and sovereign governments who try to protect and develop their own industries and improve the well being of their people are vilified by the Western mainstream media and become the target of uprisings, coups and invasions planned and organised by the financial elite’s intelligence agencies. In light of the points covered in this post, foreign aid can be seen as a first line of defence against national self-determination and development and against other reforms which might undermine the ability of the West, its banks and their multinational corporations, to extract wealth from the Third World. Whether through bribery or blackmail, or both, the elites of less developed countries know which side their bread is buttered on. Cutting off the flow of aid would altogether be far more beneficial, says Dambisa Moyo. Money from rich countries has trapped many African nations in a cycle of corruption, slower economic growth and poverty. The insidious aid culture has left African countries more debt-laden, more inflation-prone, more vulnerable to the vagaries of the currency markets and more unattractive to higher-quality investment. It’s also increased the risk of civil conflict and unrest. Indeed, the African countries that received the most aid – Somalia, Liberia, and Zaire – have all slid into virtual anarchy. The popular understanding of international assistance programs is that these programs deliver immediate needed disaster relief, or enhance the well-being of people through economic development. Arguably, that happens to some, marginal, extent. However, my view is that “we should trade, not give aid” and that the money appropriated for Western governments’ foreign aid budgets should be put back into the pocket of the Western taxpayer, thus leaving less developed countries free from the pernicious effect of foreign aid and allowing more capital to be accumulated by those in the West who produce goods and services and who are better able to enter into mutually beneficial trading relationships with the Third World.